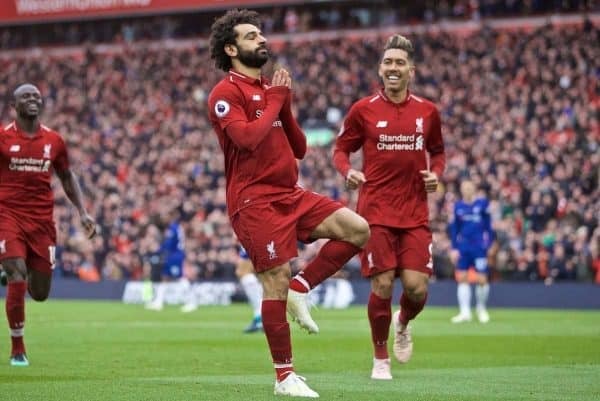 Liverpool endured a battling start before two moments of pure magic from their top goalscorers sealed a 2-0 victory over Chelsea at Anfield on Sunday. A vibrant You’ll Never Walk Alone made way for an impeccable minute’s silence before kickoff, as the two sets of supporters paid their respects on the eve of the Hillsborough disaster’s 30th anniversary. After a 2-0 win over Porto in midweek, Jurgen Klopp made two changes to his starting lineup as Andy Robertson returned at left-back and Joel Matip took over from Dejan Lovren at centre-back. Naby Keita was retained in midfield despite the availability of James Milner and Gini Wijnaldum, with Klopp opting for an attacking side in pursuit of victory. Man City made light work of Crystal Palace earlier in the afternoon to return to the top of the Premier League, but Liverpool were more than a match as they made another huge statement of intent. Liverpool started strongly and on the front foot, looking to suffocate their visitors and take advantage of any loose passes while pushing forward whenever possible. Mohamed Salah had a great chance to break the deadlock early on, but was unable to send his far-post volley either side of Kepa Arrizabalaga, while in the engine room Fabinho started in outstanding form on and off the ball. Salah teed up a good opportunity for the more advanced Jordan Henderson on 25 minutes, but the captain’s strike was blocked for a corner, which was clearly part of the plan for a deep-sitting Chelsea. The Egyptian played creator again just over 10 minutes later, cutting the ball back for Sadio Mane after a driving run, only for the No. 10 to clip his shot wide. 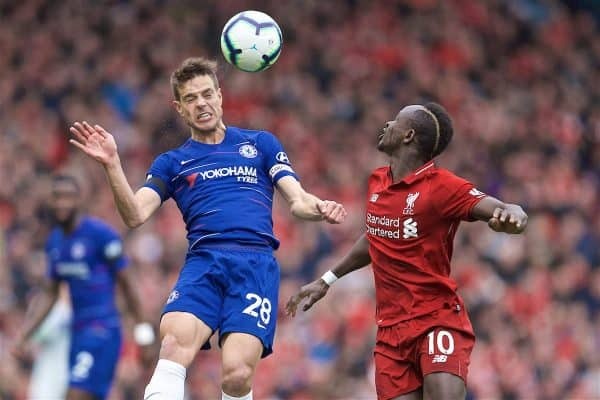 Chelsea were forced into a change before the break as the injured Antonio Rudiger made way for Andreas Christensen, but an alteration at the back did nothing to aid Liverpool’s cause as half-time came at 0-0. Neither manager made any further changes at the break, but the Reds were able to find more incision, and it took just six minutes to open the scoring. It came via Henderson who, after a frank conversation with Klopp, laid on his second assist in three games as a No. 8, lifting the ball up expertly for Mane to head through Kepa to make it 1-0. The lead was doubled straight after, and it was a Goal of the Season contender from Salah, who cut inside from the right and fired an incredible drive beyond the Chelsea ‘keeper and into the top corner. Anfield erupted. Eden Hazard then hit the post when clean through, having moved into a wide role, before Alisson made a vital stop to deny the Belgian, in what could be two pivotal moments in the title hunt. Unfortunately, Liverpool lost Henderson through injury with just under 15 minutes to play, with Klopp sending on Milner in his place as he looked to maintain control. 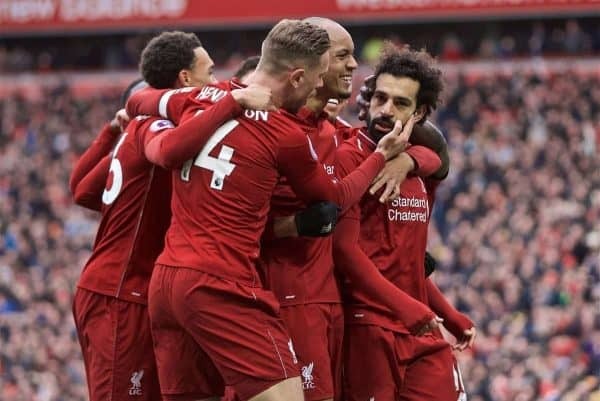 In a game that Klopp urged his side to harness the “power of Anfield,” the home supporters made a huge difference, and the roar around the stadium at full-time, as the Reds return to the top, said it all.